Testing your client apps and diagnosing issues in your server apps just got easier, with Visual Studio 2015 Update 2. Today at Build 2016, we announced several new capabilities of the Developer Analytics Tools (formerly Application Insights tools) – the facility that helps you detect and diagnose issues in your live applications. Now you can distribute your device apps (Windows 10 UWP or Windows Forms) to your beta test users right from Visual Studio. 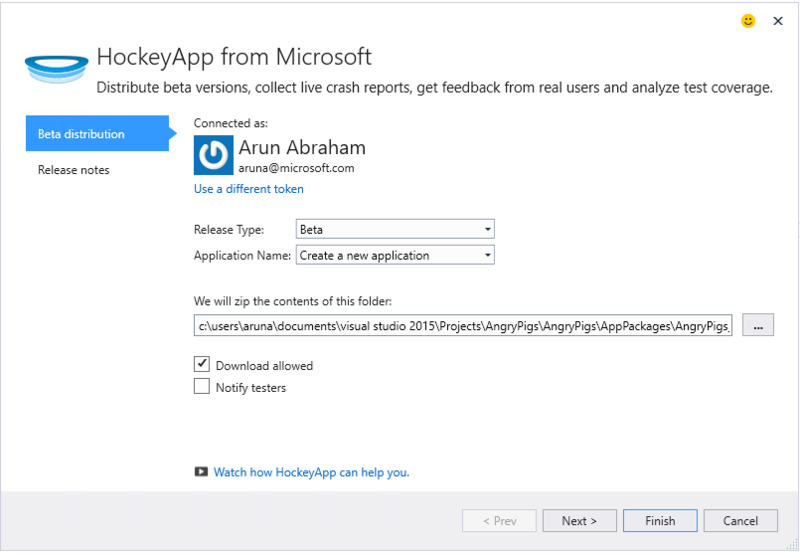 This is the first capability of HockeyApp that we’re integrating into Visual Studio. Beta distribution to a chosen subset of customers or testers can provide valuable information about your app before a broad release. You can use this information to address issues with your app before it becomes a big deal (low ratings, poor feedback, etc.). HockeyApp is our service for managing beta distribution and collecting feedback, usage and crash data. When the upload is complete, you will see a HockeyApp toast with confirmation and a link to the app in the HockeyApp portal. In HockeyApp, you manage your teams of test users, distribute different versions of your app, get feedback with screenshots, and automated usage and crash reports. More details on app management is available at the Hockey App Knowledge Base. Now let’s turn to how we’re improving diagnostics at the server side. Application Insights provides great tools for diagnosing issues, monitoring usage and tuning performance in your server app when it’s up and running. All that works by collecting telemetry from the running app and analyzing it in the Application Insights portal. But of course you can also use Application Insights while you’re debugging your app on your dev machine. You can use the powerful diagnostic facilities to help fix problems before release. From Visual Studio Update 2, you don’t have to involve the portal in that experience. A big advantage is that the telemetry from your debugging activities won’t get mixed up with the telemetry from the live version – or from the debugging runs of your team mates across the room. And if you’re writing custom telemetry, you can debug it in the privacy of your own dev environment. In Visual Studio, select the exception in the Application Insights search window and scroll to the stack trace. Provided you have the right project loaded, methods in your solution show up as hyperlinks. Click through to the code. Easy. The search window now has a tab of ‘Related Items’ queries. For example when you are investigating a failed request, use it to find out whether an exception occurred in the context of the request. A normal diagnostic session will involve a few such queries before the root cause is uncovered. Notice that there’s a back button in the toolbar to return to the previous query. You can use the ‘Find in code’ button in telemetry details to search the matching string in the current open solution. You can imagine using it to find the name of your custom event (e.g. ‘Game Over’) in the solution. The results will show up in Visual Studio "Find Results" list. Right-click on the Project Node->Application Insights->Configure Application Insights. Make sure the option for adding the right logging adapter in the configuration window is checked. Or when you build the solution after adding a logging framework, notice the pop-up that appears on the top right of your screen. Click the hyperlink to enable trace collection. Developer Analytics is a developer’s tool. (The clue’s in the name.) Its purpose is to help you continuously improve your application, by understanding how it performs – primarily when it’s in live production, but also in the debugging and beta testing phases. The updates we’ve released today are another step in that direction. We’ve made it one-click easy to deliver updates to your test users. And we’ve improved the diagnostic experience while you’re developing the next version of your app. This post is focused on the various Application Insights and HockeyApp integrations we have enabled in Visual Studio. Don’t forget to check out the broader announcements from Application Insights and HockeyApp at Build. We love to get feedback about how we are doing. Please submit questions and issues to Forums, bugs to Connect, and suggestions to User Voice.